STAY 4 NIGHTS AND WE'LL WAIVE THE CLEANING FEE! Beautiful 2 story cabin on the golf course. 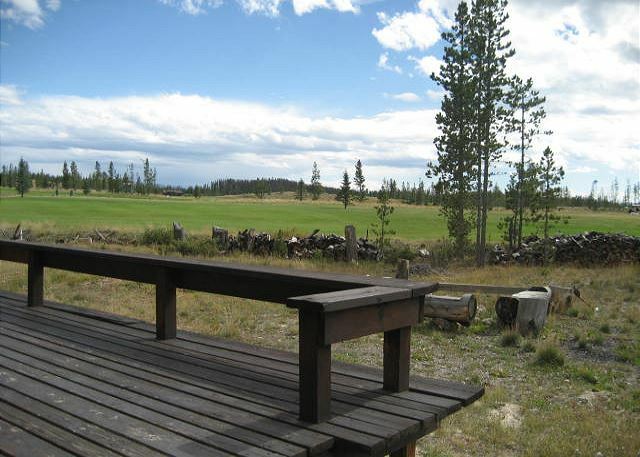 This 3 bedroom, 2 bath cabin is located on an acre lot that backs up to the golf course. Enjoy the lovely deck and quiet surroundings with mountain views as well as a newly remodeled kitchen and very comfortable living room with flat screen TV. Free WiFi too! Woodburning fireplace for chilly Colorado nights! 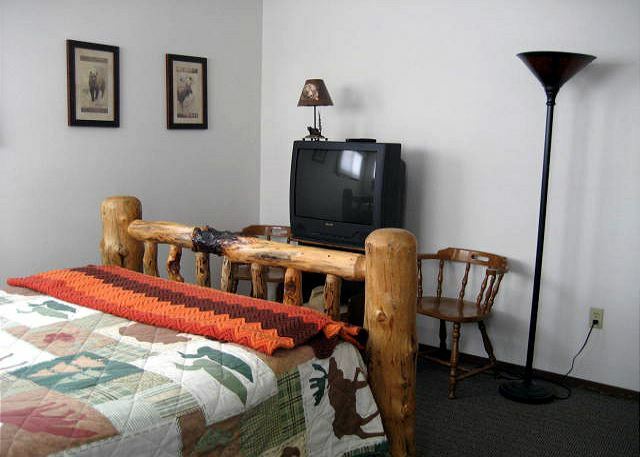 Only minutes from Grand Lake and Rocky Mountain National Park, there are ample opportunities for viewing wildlife in this area! SORRY, WE CANNOT ACCOMMODATE CATS. For Pet emergencies call Dr Annette at Trailhead Mobile Veterinary Clinic at. We hope to see you again. The perfect place for a mini vacation! The Rental Company was wonderful. Very informative. Helpful. I would definitely recommend Grand Mountain Rentals again. We stayed at Shell cabin late Sept. I think it offers everything you would want in a vacation get away. Close to town, shopping, golf, & the park. We saw deer, elk, chipmunks, & a fox from inside the cabin. (small dog owners need to be outside with their dogs because of the fox). The property managers are good. The cabin is comfortable, well located to everything. Unfortunately the one thing I require is a few minutes of WIFI a day for my company. We did go to the HUB (downtown) daily for good hot chocolate & WIFI. I couldn't work with some photos with my Photoshop program or search other things to do in the area without WIFI. The trip to the HUB was OK but a little inconvenient. My wife & I would both recommend Shell cabin. Had a wonderful time. Location, location to activities in Rocky Mountain National Park. Towel were plentiful and fluffy. Could have used an ash bucket and matches/lighter for fireplace. Grill needs new parts. Glad you enjoyed your stay at Shell Cabin and made special memories with the grandkids! It is a great, dog friendly cabin and happy to hear you plan to come back! We had a wonderful time - beautiful weather and the accommodations were great! Thank you for your review and we are so sorry you had some issues at this home. As stated at check-in, if you had any issues at all with the cleaning, or anything else, you could call us immediately and we would come right over to rectify the situation. Without knowing you had issues during your stay we could not correct the problem. All other reviews from stays this summer have been five stars across the board for this home. We have taken note of your feedback and will ensure these issues are resolved. we needed. I would highly recommend the rental agency and the Shell home. So glad you enjoyed your stay. Thank you for the nice review! Our experience was outstanding. The people of GL were all great and you could not beat the surroundings! My family had a wonderful time at Shell Cabin. We attended a wedding at the Winding River Ranch and the cabin was within walking distance. One note, the floor plan provided is not completely. Upstairs with the king bed is a queen/double bed instead of the futon, and the futon is now in the main level bedroom. I would recommend this cabin to my friends and I would stay again. Our party of five adults was very comfortable at the Shell cabin. The kitchen was well equipped for all the cooking we did. We thoroughly enjoyed the deck and the grill worked very well. We enjoyed watching the golfers and the occasional wildlife. We were quite satisfied with our experience. Thank you for the great review! So happy you enjoyed your stay at Shell Cabin. It is a special cabin and we are happy you enjoyed watching the golfers and wildlife! Please come back again! Shell Cabin - Location! Location! We had a wonderful time at Shell Cabin. Loved the location to Rocky Mountain Park. Only complaint was a lack of extra hand towels in bathroom. Hope to stay again. Great cabin! Very clean and in a beautiful location. So happy you enjoyed Shell Cabin and your stay in Grand Lake! Please come back and visit us again! Beautiful, clean and comfortable. Close to town and the State park. Saw moose within 2 minutes of our cabin! Calise was so nice, funny and a great help to us during our stay. Karen, I am so glad you enjoyed Shell Cabin and your stay in Grand Lake! Thank you so much for the kind words. It was a pleasure meeting you and I hope you come back again! In One word? " EXCELLENT "
Hi Dave, so happy you enjoyed your stay at Shell Cabin! It is a great home. Come stay with us again! The Cabin is well kept an cozy it backs right up to the golf course. we loved it and we will back for sure. We enjoyed our stay at the Shell. You cannot beat the view. The best part was sitting on the back patio watching people golf with a mountain backdrop. The place is nice and you can tell the owners take a lot of pride in their cabin. I would recommend staying here. This past weekend was one that my family will remember for a while. The location was great with an amazing view of the golf course. The interior of the residence was well kept and there was nothing to be disappointed about. We absolutely loved our stay here and would come back again.